Miss Jill PR had so much fun with the private showcase room at Folk Alliance Room that I decided to bring it back – by showcasing Georgia Music Artists. I am on the hunt for 12 slots that musicians solo or group, can play unplugged or quietly amplified for one set of 45 minutes on one night during the week of February 14-18 conference week. I am hosting three nights Thursday, Friday and Saturday nights from 11 PM to 3 AM. I’d like to leave one or two slots open for a “friend of GA music” so perhaps 10 slots would be sufficient. What these small listening rooms entail is you to set up and play in front of anywhere from 1-20 people depending on the size of the room. I had about 10-15 at one given time and a revolving door through the night. Each room is unique with set up, theme and hosts in how they promote it. What makes the FAI conference different than any other event is that it’s all housed in two hotels that have a walk/breeze way connection so you never have to go outside. They rope off three floors above the main ballrooms to provide a great area for everyone. You can book as many as you want online via Folk.org after you become a member and sign up for the conference. 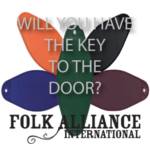 Folk Alliance International is a great week of meeting folks from around the world, meeting and greeting in the halls or at the showcases. There are panels that include everything from legal to touring to PR to accounting. MusicCares comes in and sets up camp with eye, ears and dental check ups. There are workshops that attendees can take part in and take lessons from some of the best musicians in the world. House concert presenters are abundant in looking for performers for their series as well as Performing Arts Centers. Everyone is after the same thing, how to make a living presenting the arts. FAI takes place in Kansas City, MO during February 14-18, 2018 and it will be their 30th Anniversary. SO how does one GA musician apply to be in the GA ROOM? It doesn’t matter if you are a one man band or 5 piece barbershop quartet if you can get there; you can apply. Serious musicians and groups only apply. I treat these shows as if you are playing a venue of sorts. There is no pay for you, but you might be asked to pay for a slot if I have a high demand. And other showcase rooms have the same policy. I think the cool part of having a GA State Room is that we can have every kind of genre of music cause it’s all rooted in folk. if you aren’t able to be there for the full week, then tell me what day would work for you. 4-cross your fingers and hope and pray… that I chose you. So good luck and let’s cause some Acoustic Chaos!